27 October 2009, at 9:34a.m. 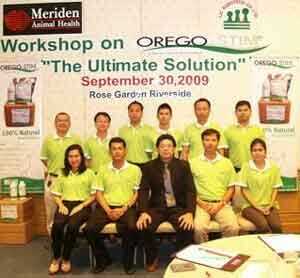 THAILAND - LIC Agrotech recently held a workshop entitled <em>Orego-Stim – The Ultimate Solution</em>. LIC Agrotech, Meriden's exclusive Orego-Stim distributor in Thailand, recently organised a workshop for their sales team entitled Orego-Stim – The Ultimate Solution, which was held at the Rose Garden Riverside Resort near Bangkok. Dr Kelvin Chong, Regional Technical Sales Manager for Meriden Animal Health Limited, who led the Orego-Stim workshop was extremely pleased with the participation by the members at the workshop. He said: "It was great to see how positive and enthusiastic the team were to learn more about Orego-Stim. It is a pleasure to work with them."